In skilled trade and industrial services, a switch to laser technology has been slow in coming. Manual skills often do the job faster than programming a laser system. Things began to change when our product partners, Alpha Laser, introduced the world’s first mobile laser device, the ALFlak Max. The advantages are obvious. It’s a lot simpler to take a mobile laser to a machine or component weighing several tons than move it to the repair tool. With a mobile laser, transport, removal and reinstallation time are eliminated. The machine or component is back in operation faster and the repair costs are considerably lower compared with other welding processes. 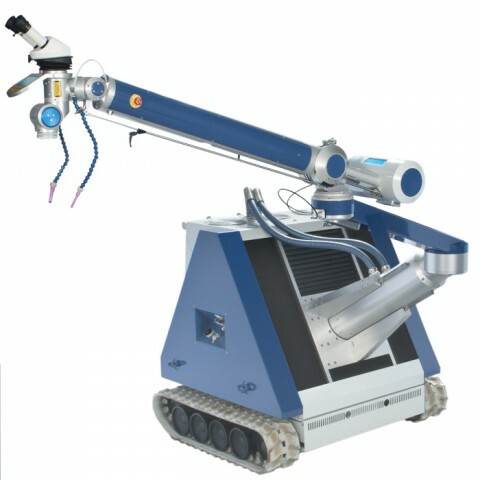 With the introduction of the Alpha Laser ALFlak Max mobile laser system, especially large components can now benefit from laser welding. This flexible high end laser is ideal for programmable deposit welding on large surfaces, for example, on large machine or design components and injection moulding or forming tools. With its extra large, moveable arm and flexible laser head, the ALFlak Max can reach almost any welding location. It can work at up to 2m high and 80cm deep. With its enormous reach of nearly 2.80m, it can also weld right inside large tools and components. The system’s digital controller is designed for X, Y and Z axes movements and there is an optional rotating R axis. The ALFlak Max provides excellent ease of use by precisely stopping the feed without any trailing movement. This user friendliness can be further enhanced through a joystick option which provides an absolutely uniform feed rate and an extended high hear for positioning the repair subject. Through the unique and patented semi-automatic User Coordinate Controller, even complex 3-dimensional sequences can be carried out. This allows the operator to concentrate on the job no matter how off-kilter the weld seam is. Laser sources with up to 250W output are available for the system and there is a choice of two models. One with a caterpillar track for easy transport and positioning, the other with an undercarriage for transport via a pallet truck.